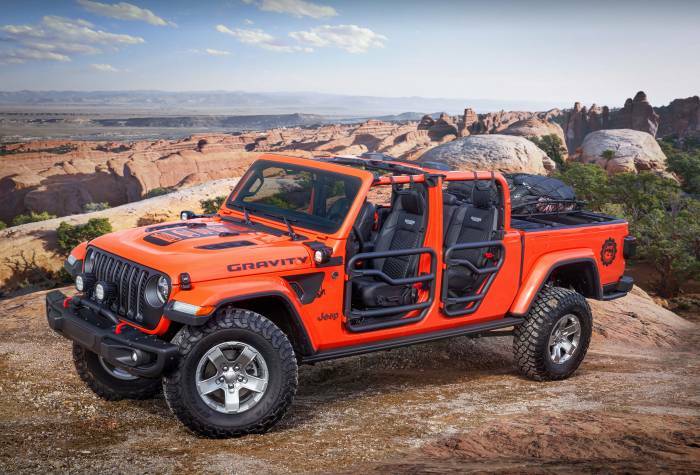 Every year, Jeep teases us with some over-the-top concept vehicles at Easter Jeep Safari. 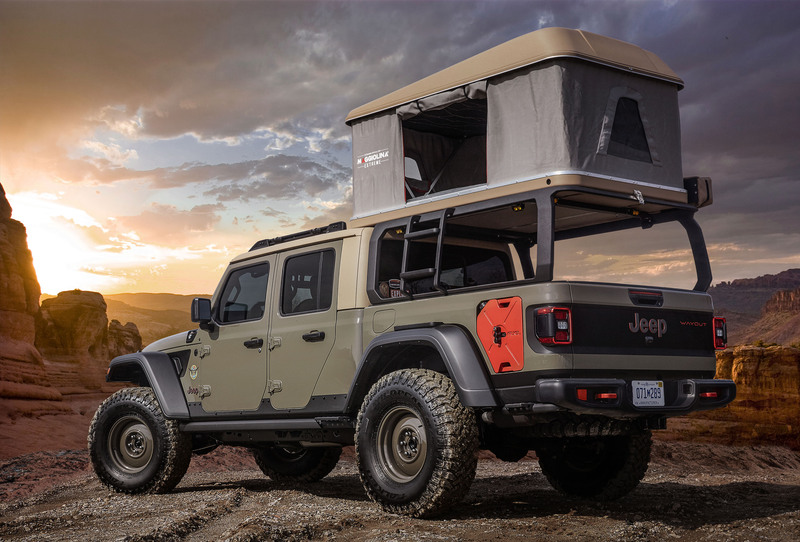 With the launch of the Jeep Gladiator pickup, the Easter Jeep Safari 2019 concepts are all insanely cool Jeep trucks. 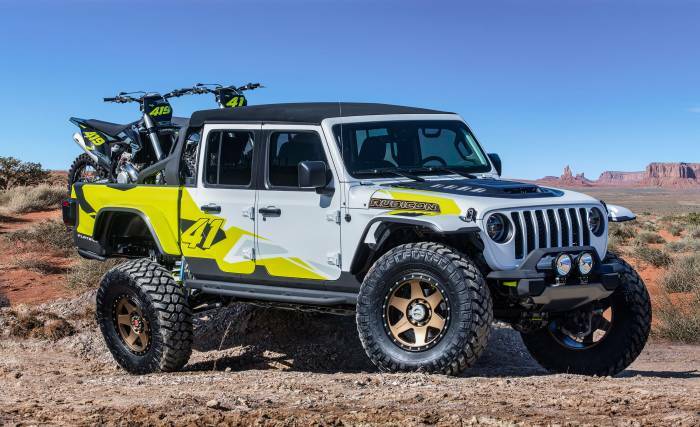 Jeep just unveiled six concept vehicles for the 53rd annual Moab Easter Jeep Safari. They are all Jeep Gladiator truck-based concepts. From overland to retro, these concepts provide a good look at the versatility of the Gladiator chassis. They’ll also spark ideas for your own build. While all of these concepts are really cool, which is your favorite? The Jeep Wayout Gladiator concept pickup truck is all about overland adventure. It has a rooftop tent, 270-degree awning, and LED area lighting. A custom bed rack not only supports the rooftop tent but also has an integrated ladder to access the tent. To get way off the beaten path, the Jeep Wayout has auxiliary fuel tanks integrated into the bedsides. A 2-inch lift and 37-inch tires make sure there isn’t much that will stand in its way. 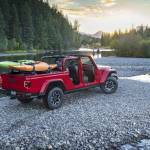 Onboard air, a winch, and a snorkel further enhance its off-road capability. A custom integrated roof-rack system built into the hardtop provides a place to carry bulky items. A decked drawer system in the bed provides lockable dry storage for your gear. The Gator Green paint on the Wayout concept is actually a production color on the new Jeep Gladiator. The 17-inch steel wheels harken back to the old Willys pickups. They not only look good but are also a quality off-road wheel option that’s cheap to repair. The Jeep Gladiator Gravity concept is something you could walk into a dealer soon and spec out for yourself. It’s a rock-climber-inspired Jeep Gladiator Rubicon with a full host of Jeep Performance Parts. In the bed, there are cross rails and a cargo basket suspended over a Decked truckbed storage drawer system. The cabin is all about open-air off-road motoring and has steel tube doors. The Gladiator Gravity also features a 2-inch lift and 35-inch tires on 17-inch gear wheels. Heavy-duty rock rails, a satin-black grille, and lots of LED lighting complete the look. A cold-air intake and cat-back exhaust system ensure this off-road machine breathes easy. This is the pickup truck for climbing or mountain biking adventures in the American southwest! 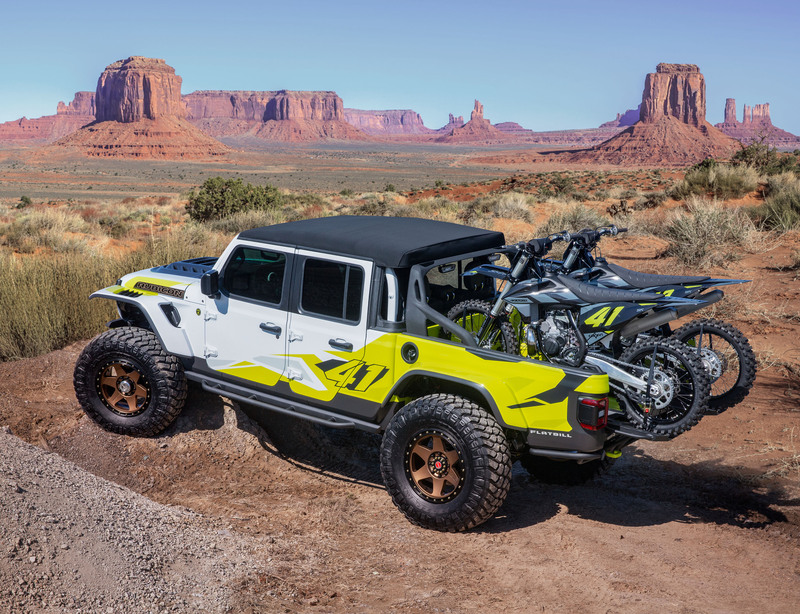 The Jeep Flatbill concept is all about dirt bike adventures. Jeep custom built it to haul two dirt bikes and get to hard-to-reach trailheads. It also has a loud, aggressive attitude with its bright paint, custom carbon vented hood, 20-inch wheels, and massive 40-inch tires. Jeep custom-built the truck bed to haul the bikes. Builders removed the tailgate and added two custom slide-out wheel ramps. The underside of the bed has also been trimmed, both for looks and better off-road clearance. A custom front bumper/skid plate combo and rear tube bumper also provide improved entry and exit angles. Between the massive tires, big custom shocks, and improved clearance, there isn’t much that can stand in the way of this truck off road. Jeep usually builds a restomod as part of its concept fleet each year at EJS. This year was no different, as it built this over-the-top 1968 M-715-based truck. The “Five-Quarter” name is a historical nod to classic Jeep trucks that were one and one-quarter tons, or 5 quarter-tons. The original chassis has been fully reinforced and updated. It features rock sliders, custom bumpers, and a heavy-duty link/coil suspension system. All of that is needed to handle the 700-plus-hp, 6.2L supercharged Hellcrate Hemi V8 under the hood. Beefy axles at each end and massive 40-inch tires also let you know this truck means business. Jeep replaced the original front steel body with a full-carbon unit. The truck bed has been fully custom built out of aluminum and sports LED lighting. The convertible soft-top has been lowered a full 3.5 inches, further enhancing the Five-Quarter’s custom monster truck look. 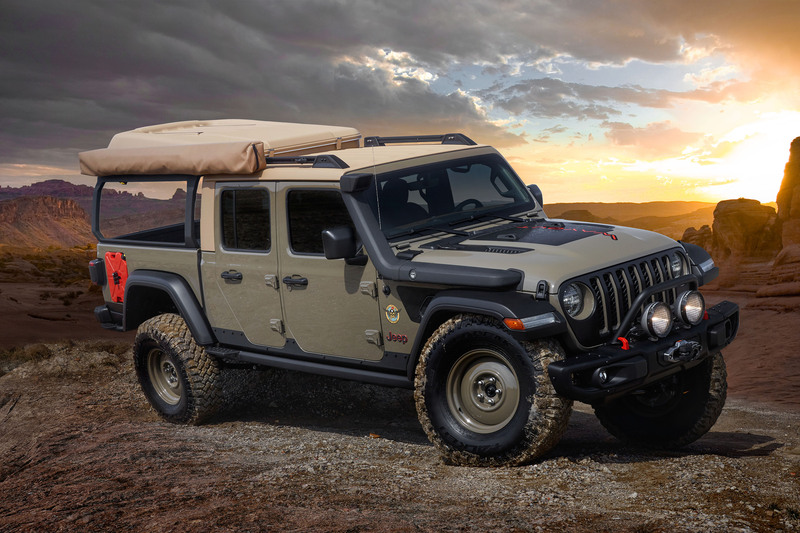 The team at Jeep took a Jeep JLU Wrangler Rubicon and built it into a two-door Jeep truck. The design harkens back to the 1978 Jeep Honcho pickup. The brand calls this Metallic Brilliant Blue beauty the Jeep J6. The J6 features a two-door cab with removable hard-top. It also features a 6-foot truck bed. In the bed are a prototype roll bar and tire carrier. 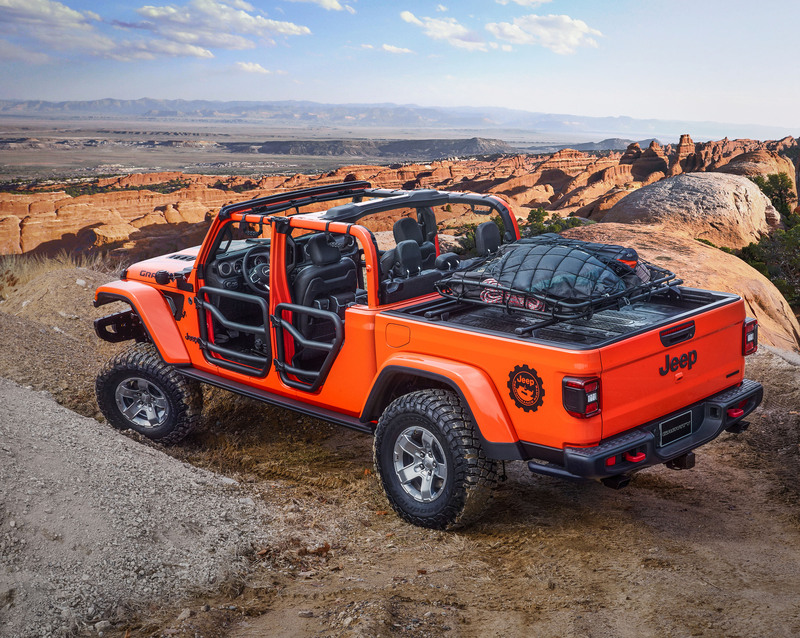 Other prototype parts include 17-inch beadlock wheels, a 2-inch front bumper bolt-on stinger bar, and customized Gladiator rock rails. The Jeep J6 also features a 2-inch lift and 37-inch tires. LED lighting is abundant on the truck. Lots of small interior touches integrate Jeep heritage, modern performance, and the clean OEM style the J6 exudes. Who doesn’t like classic Jeep graphics?! The Jeep JT Scrambler is a throwback build inspired by the early 1980s-era Jeep CJ8 Scrambler. The JT Scrambler is based on a Gladiator Rubicon, with graphics, paint, and a bed-mounted roll bar that gives the build a vintage feel. The rest of the build is basically a grab from the Jeep Performance Parts catalog. The JT Scrambler features a 2-inch lift, 37-inch tires, LED lighting, a cold-air intake, and cat-back exhaust. 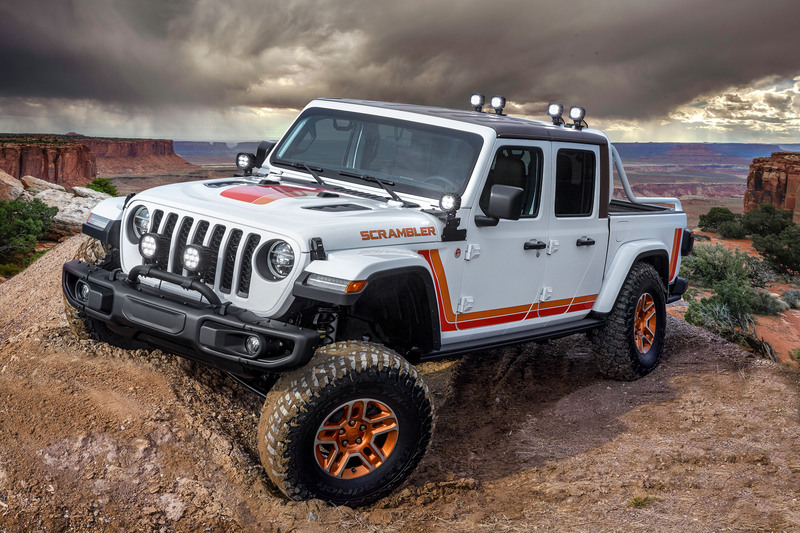 A dealer or enthusiastic new Jeep Gladiator owner could easily recreate this concept build. Jeep Truck of Your Dreams? Personally, I’d like to see an extended-cab, 6.5-foot bed Gladiator with a V8 Hemi under the hood and rolling on 37-inch off-road tires. Jeep knows it isn’t going to offer anything like that, so it didn’t want to get our hopes up by building a concept in that style. Of these six remarkable trucks, the Jeep Gladiator Gravity is probably the one I’m supposed to like the most. It’s the closest thing to attainable, I love orange, and it’s rock-climber-themed. While the Gravity is cool, the 2019 EJS Jeep concept that really tugs at my heartstrings is actually the Five-Quarter. It’s hard not to appreciate a 700hp, drop-top, super-off-road-capable piece of functional art. All in, the Jeep Gladiator is an impressive truck off the assembly line. With these concepts, we get a look at how far the platform can go. 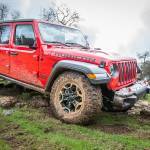 If the Jeep truck appeals to you, have a read of our Gladiator first drive impressions.